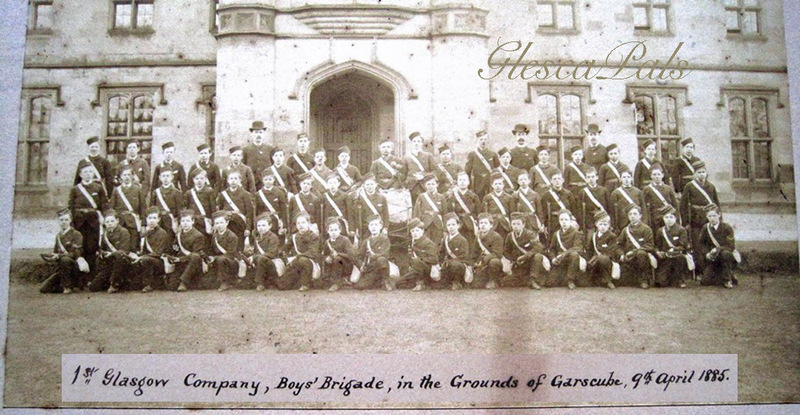 Old photograph of the 1st Glasgow Company, Boys' Brigade taken 9th April 1885. Kindly sent to me June 2013, Jim Vallance, Ayr. Following its formation as conceived by William Smith, the first muster of The Boys' Brigade took place in the Woodside Mission Hall of the Free College Church on the 4th of October 1883. Twenty eight boys paraded under their Captain and his two Lieutenants the brothers Hill. Despite doubters, its success soared, Smiths courage and divine gleam proved to be on the right lines. Early in 1885 with five companies building rapidly, the founder realised the need for greater organisation and for a clearly defined constitution to meet the possibilities of the Boys Brigade becoming a national movement. And so, at his home at 4 Ann Street on 26 Jan 1885, the historic meeting was called which constituted itself into the Council of The Boys Brigade. Present with the founder were J.R. Hill, J.B. Hill, J.S. Couper, J.B. Couper, F.P.R. Ferguson, E.W. Hamlen, and W. Nichol. Sir William Smith (knighted in 1909) had a heritage of upright living, firmly disciplined by exemplary military service. His father was an officer in the 7th Dragoon Guards. Since coming as a boy from Thurso to to stay with his Fraser uncle and aunts at 28 Hamilton Park Terrace, William Smith always had his Glasgow home in Hillhead. On 7th May 1914 while in his sixtieth year , he attended a great display by The Boys Brigade in The Albert Hall. The following day he collapsed in his London office and died of a cerebral hemorrhage two days later. 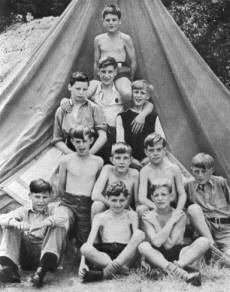 On the 30th April 1971 the official world membership of the Boys Brigade amounted to 255,495. Hi Will,Thanks for the photos of the 1st. Glasgow. I will pass them on to the 'first' in case they don't have copies. It's great to hear from you......all the best to your colleagues at PiggeryBrae. my great grandfather is pictured in the 1885 photo of the 1st Glasgow company. 2nd row down, 5th from the left. I'm the 4th Munro in our family to be involved with the BB. I was a member & officer in the 3rd Bromley (Orpington) Coy. BB founder Sir William Smith in the photograph. One early innovation was to hold a camp - at the time, public opinion was aghast at the idea of Boys camping out in the "wilds"! The first camp by the 1st Glasgow company was held in a building at Tighnabruach on the Kyles of Bute in 1886. Camping spread rapidly and camping under canvas soon became the normal order of the day. Often camping became looked to as the crowning of the company's year.